You know the old line, if you don’t like the weather in (fill in the blank with your favorite location), just wait 5 minutes. For June in Northwest Ontario, wait a day and multiply it by 10. We began the week with buckets full of cold rain, followed by a day of sustained winds of 30 mph, backed up by clear, cold flat calm conditions, overnight lows in the 30s, moving on to another all day rain, succeeded by high winds with bursts of cold showers on an hourly basis. The fish didn’t know what to do and neither did we. 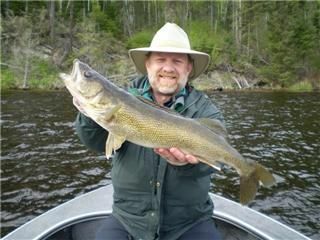 Walleyes were caught everywhere between 2 and 27 ft., from early spring spots to transition, and with aggressive presentations to finesse. At times, you tried all of the above in one morning, before you figured out a pattern that may have lasted for half a day. Overall, it was a slow bite and we worked hard to catch neutral to negative fish. The trick was to decide when and where to slow down and put your time in. Guess wrong 3 times in a row and you had a pretty short sheet at the same time that other guides had done well. 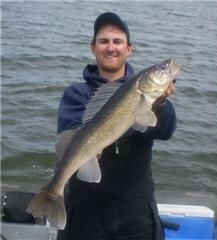 Volume dropped off for walleyes this week with the guide stat sheets averaging 20 walleyes over 18 in. per boat per day. The highest daily total was 47. 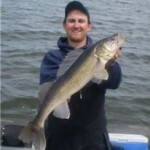 For the week we had 22 walleyes over 27 in., including 10 – 28s, 1 – 29, and a massive 31 in. 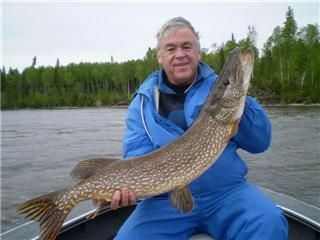 fish caught by Guide, Brad Stitt. The bass bite went on the skids along with the weather. Many fish dropped back down into deeper water or more often than not moved to mid depth zones that were closer to deep water. 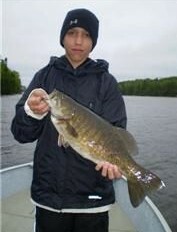 For the week, we had 53 bass over 17 in., including 16 – 18s, and 2 – 19s. 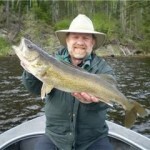 About 1/3 were incidental catch while walleye fishing and most of the rest were caught on jigs and grubs bounced slow over rocks in the warmer bays. Active locations changed dramatically during the week. A shore line that produced dozens of fish one day, would be vacant the next. 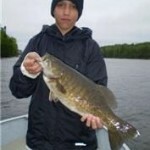 If you could find warm dirty water in a “bassy area”, there was a good chance you could find semi-active bass. 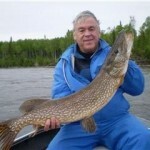 Big Pike were incidental catches while walleye and bass fishing this week. We had 3 – 39s and 1 – 40. 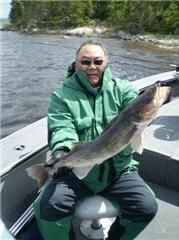 Two of those fish were caught by long term guest Pete Bloom and the biggest was an absolute monster. The average 40 in. 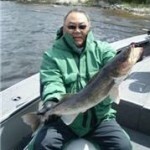 pike weighs between 17 and 18 lbs, but between the kink in her back, massive width, and depth, it is my best guess that this fish weighed over 23 lbs. It takes an exceptional fish to get me rattled and I will confess that I pushed the “off” button on the camera when I tried to take the first photo and possibly the second. All the guides know what it takes to instigate a hot bite. We watch the 5 day forecast and when it isn’t there, we check the 14 day outlook. More often than not, both are wrong! In the end, you make the best of the day you have and work hard not to make excuses. We have the advantage of working with an exceptional fishery, so that even when the bite isn’t as fast and furious as you would like, it is still the best show in town.